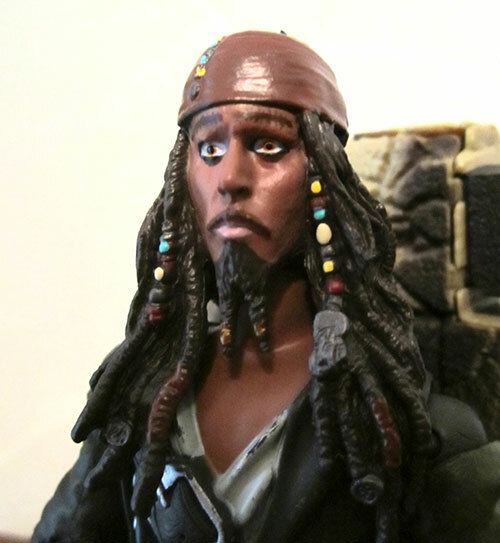 Debbie Valenta checks in with a look at one of the new Pirates figures available at the Disney stores. Tell us all about it, Deb! After Disneyland came out with two subpar Indiana Jones figures, I was curious to see if they’d put more care and effort into a figure of one of their own iconic characters. Turns out the answer is yes, but barely. 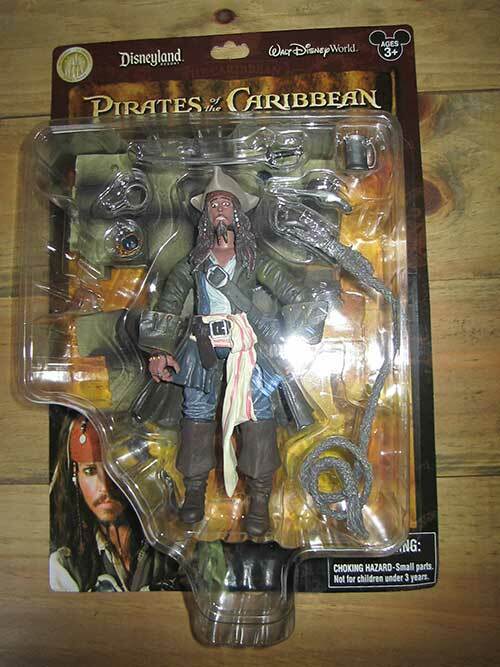 It’s the inconsistent quality of the figure and it’s accessories that make it hard to get excited about this particular Captain Jack Sparrow. 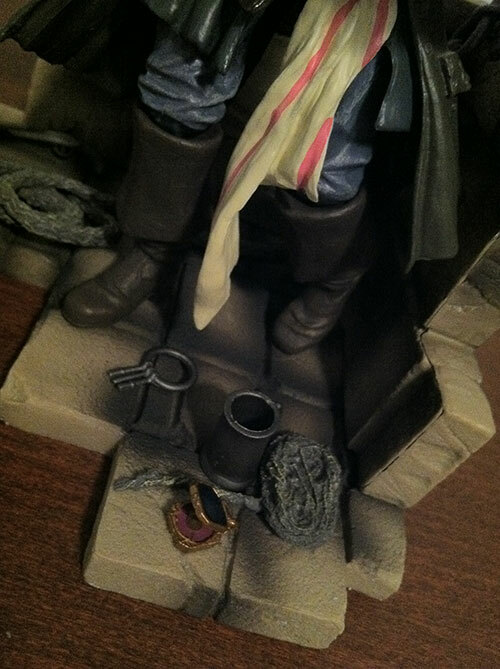 The figure’s release coincides with that of the newest film and while his costume is circa Pirates 4, the accessories could be from any of the films. As with the Indiana Jones figures, the packaging is monstrous and not at all collector friendly. The package was decimated to get at the figure and while the art on the massive card is passable, it’s pretty bland and I can’t see an adult collector being motivated to buy a second Jack to keep in the package. 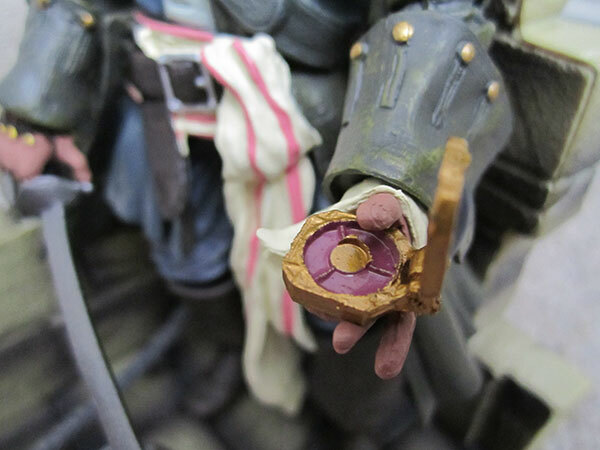 The sculpting, from what I can tell through the thick application of paint (more on that later), is pretty good. From his dreads, to his coat, to his boots and scabbard buckle, the texture is nice and they manage to affect a nice “flow” in representing the fabric. 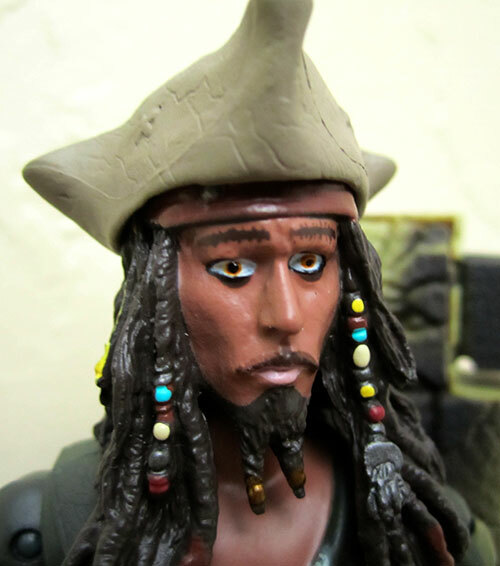 I’m even going to give them the benefit of the doubt and say that while the face is a bit long, it ‘s not an awful representation of Depp, just not all that great either. The hands are nicely done and can hold almost all the accessories with ease. The only thing I had any difficulty with, was the pistol and even that I got into his hand with some coaxing. The only thing that’s really careless is that the two ends of the jacket on either side of the hip swivel don’t line up at all on the one side. The greatest weakness of this figure is the paint. It’s inconsistent throughout. On the one hand, the painting is very clean and they do a nice job of aging up his boots and hat. Especially impressive is the work on Sparrow’s trademark hair beading and the buttons and buckles of his outfit and his many rings and bracelets. On the other hand, the buttons on the back of the jacket are completely ignored by the painter and for some reason, his white and red-striped sash looks like the paint was troweled on and what should be fine, red stripes are far too thick and pink. 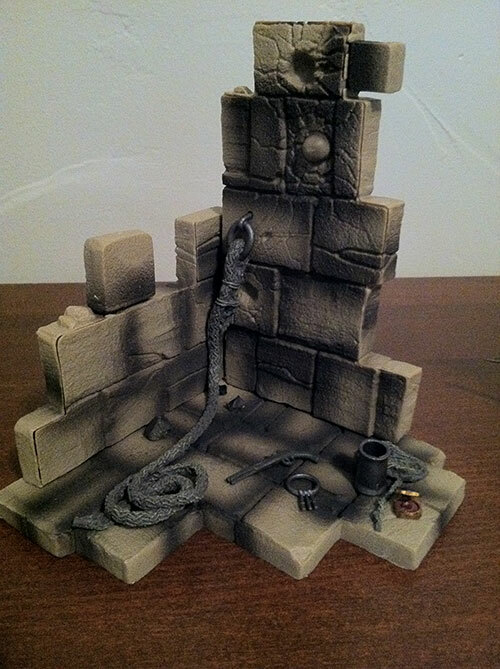 The base that comes with the figure—what I assume is supposed to be the sea wall of the port, is given a lovely impression of texture by a spray of black paint---but the cannonball embedded in the stone is left completely untouched and is the base color of the stone, not black. I suppose it would be easy enough to fix yourself, but really, why should you have to?? The worst offense however, is Sparrow’s face. 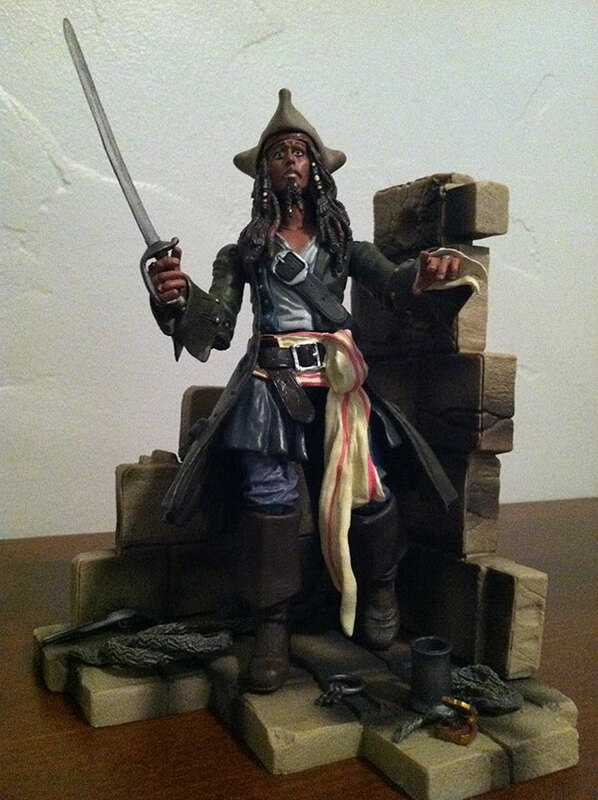 The skin tone is way off—so far off that he looks like he’s in blackface and when you have Depp’s own visage emblazoned on the packaging, you’d better get it right! In addition to the mystifiying choice of paint color, it’s also far too thick here, obscuring what I suspect is actually a decent portrayal of Johnny Depp. Lastly, the eyes—the irises are painted a very off-putting color of yellow that at best make him look jaundiced and at worst, make him look like a stoned zombie. 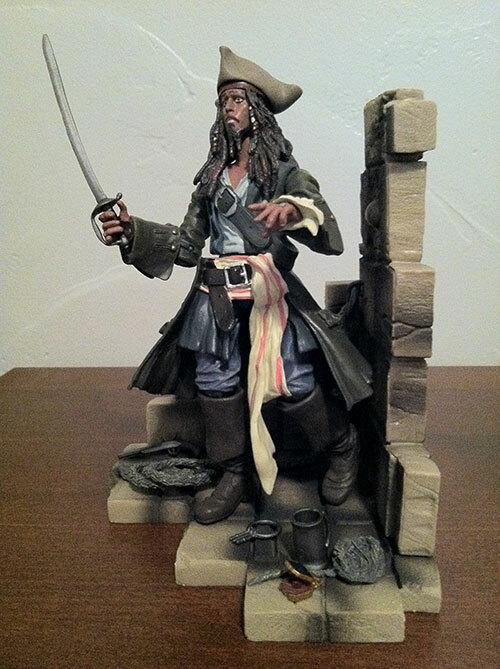 This Captain Jack Sparrow is nicely poseable and stands quite well, either on the base OR on his own. With cut wrists, ball joints for the shoulders and hips, elbows and keens that bend, and a hip swivel, there really aren’t too many scenarios you can’t put your Jack into. The head is limited to side to side motions and the leg movement might be impeded by the rubbery longcoat but it still works. No ankle joint here but with his big sea boots I didn’t really expect it. 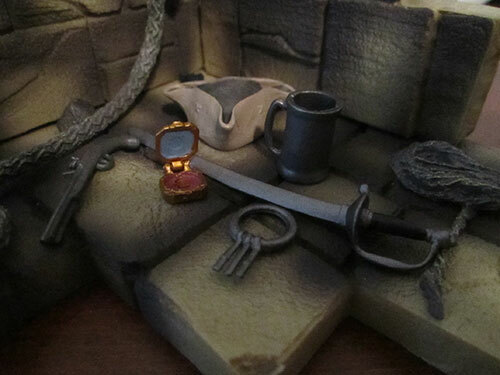 A fun number of accessories comes with Jack, especially if you consider the base an accessory. First, there is his worn tricorn hat that fits his head very well. I actually thought it was a sculpted part of the figure before I opened him up. 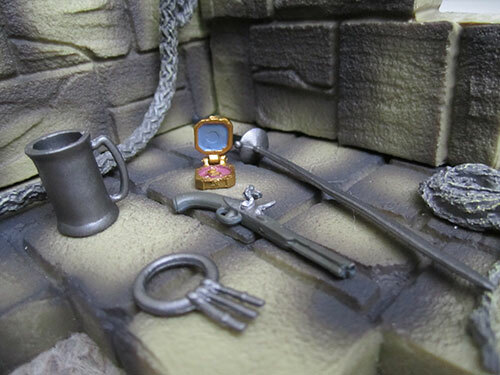 He includes everything you’d need for a worthy pirate captain including a sabre, tankard, ring of keys, pistol and his trusty compass. Each fits into his hand well, except perhaps the pistol, which took some maneuvering to get it to stay in his hand. The compass I was especially pleased with, has it’s actually made of two pieces and although very small, can be kept closed or opened up for navigating the high seas. The base comes in three pieces which fit together well, plus an additional dockline attached to a ring that can be fitted into the wall. 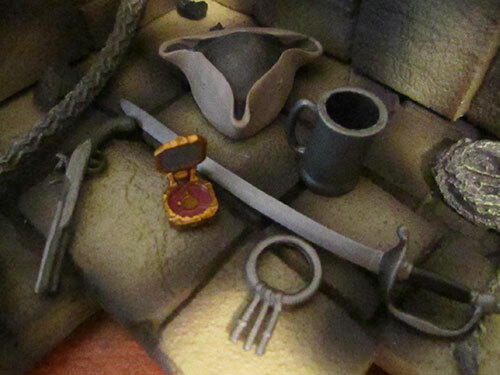 As mentioned previously, these are all accessories that aren’t specific to any one film and it would have been nice to include something from “Pirates of the Caribbean: On Stranger Tides.” Ponce de Leon’s pair of goblets would have been an obvious choice. 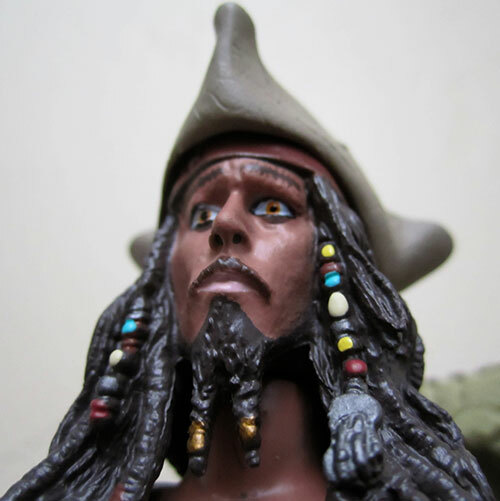 With his poseability and fun pirate gear, Jack is bound to provide hours of play at the beach for kids and the adult collector could have quite a bit of enjoyment themselves trying to emulate some of Depp’s more iconic poses. outside the Park, you don’t need to shell out for a park ticket just to pick him up--but I can’t see too many collectors picking these up in multiples of two. Not much—the compass is small and came apart when removing it from the packaging but the cover snapped back on easily enough. A fun, minor piece to sit on your desk in your cubicle at work but not something you’re going to want to proudly place in the front of your display case. A bit more care taken with the painting and better portrayal of Depp and that could have been a different case.